Manchester United vs Arsenal is always an intense and epic battle, with both clubs trying to get the better of the of each-other. The battle between the two clubs has been fierce to say the least, which at times has resulted in on-pitch violence and trouble. But all that has never stopped the matches from being one of the finest in English football. However, one thing which remains certain in almost every single Manchester United vs Arsenal game is that players are never scared of playing dirty. The match is always a must win for both the teams. As Arsene Wenger’s Arsenal prepare to face Jose Mourinho’s Manchester United, FootTheBall brings to you the 7 dirtiest matches played by the two English giants. This game wasn’t nearly as dirty as the famous battle of Old Trafford in 2003, but even then the game saw just as many cards being shown. It was Danny Welbeck who put the Gunner’s ahead in the second-half, but the game changed when a struggling United side lost Angel Di Maria after he received two yellow card’s, firs for diving and then for grabbing referee Michael Oliver’s shirt. Robin Van Persie opened the scoring for Manchester United against his former club Arsenal as the Gunners went down 2-0. To make matters worse, Jack Wilshere received a second yellow card for an outrageous tackle on Patrice Evra, leaving Arsenal to play the last 20 minutes with 10 men on the pitch. 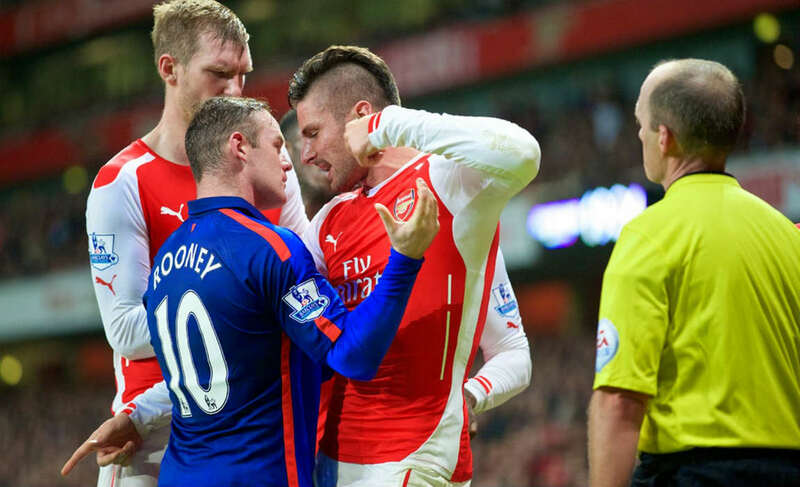 Probably a rare Manchester United vs Arsenal match that saw no red cards being shown. 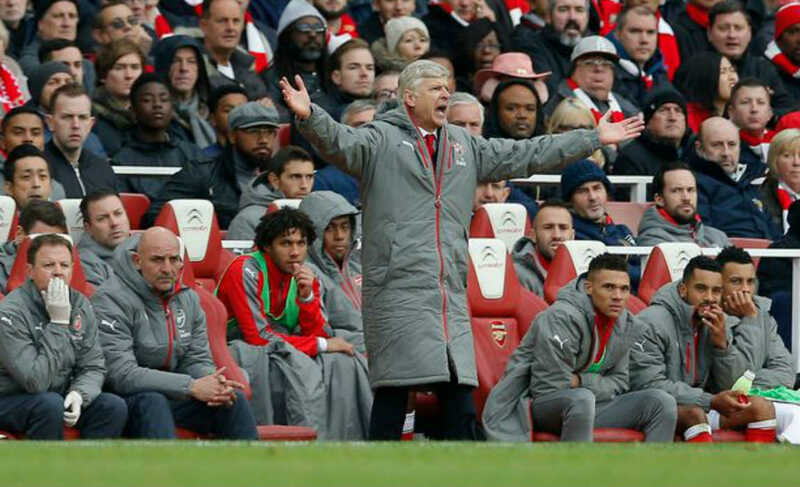 However, Gunners boss Arsene Wenger was sent to the stands after he kicked a plastic bottle in frustration after Van Persie’s injury time goal was denied as offside. Six Arsenal players were booked in the match, Gunners lost after Abou Diaby scored an own-goal in the 64th minute just 5 minutes after Rooney had given the Red Devils the lead from the penalty spot. 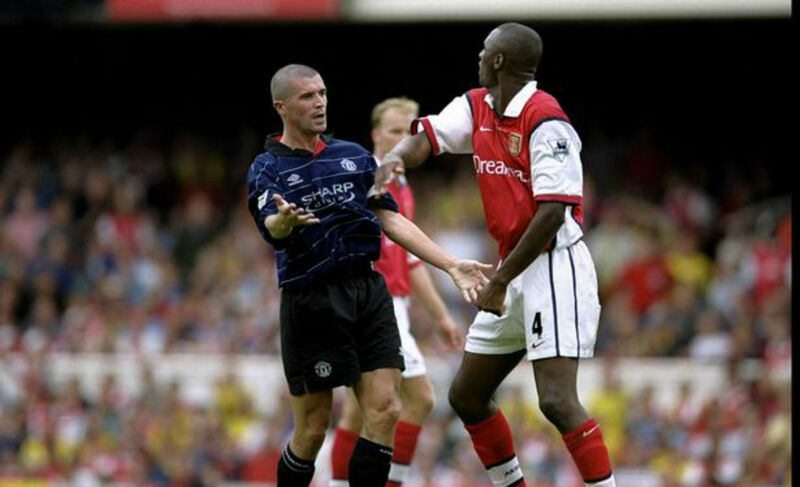 This match was so intense that both the captains Roy Keane and Patrice Viera were involved in a tunnel brawl even before the match started, referee Graham Poll had to intervene to calm the nerves. Viera opened the scoring for the Gunners in the 8th minute but Ryan Giggs equalized for the Red Devils just two minutes later. Dennis Bergkamp again gave Wenger’s side the lead but Ronaldo scored to put United on level. In the end John O’Shea found the net to help United earn three points, However, Mikael Silvestre was sent off in the second-half for a rash challenge on Freddie Ljungberg. One of the most fierce and dirtiest football match ever played. This game is remembered for the infamous injury-time penalty miss from Ruud Van Nistelrooy, which led to a wild reaction from Gunners fans and players. This game saw 7 bookings, with Patrice Evra getting sent-off after receiving a second yellow card. Four Gunners stars were suspended for their actions in the match, with Lauren getting being banned for four matches, Keown three and Ray Parlour and Patrick Vieira one each. Manchester United dominated the game from the start, scoring thrice in the first-half, infuriating both Arsenal players and Arsene Wenger. 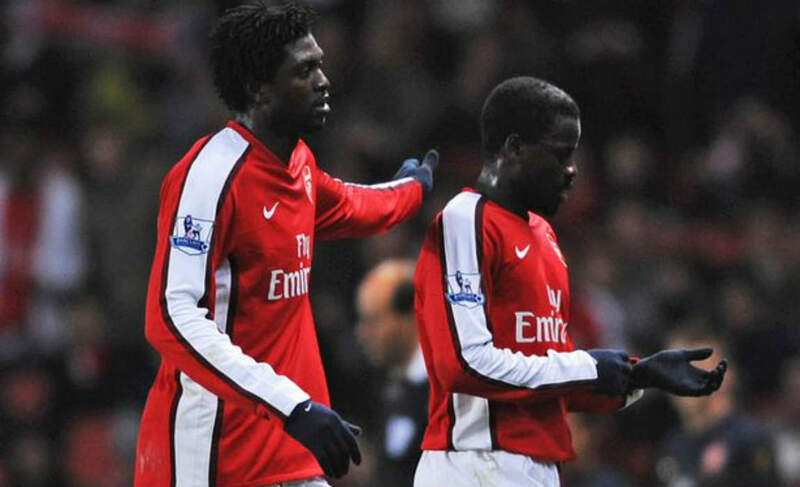 The second-half saw Arsenal’s Emmanuel Eboue getting a straight red card after a horrendous challenge on Patrice Evra. Interestingly, all the bookings in the match came in the second-half. A disastrous season for the Gunners as they finished 12th, just one position behind bitter rivals Chelsea. 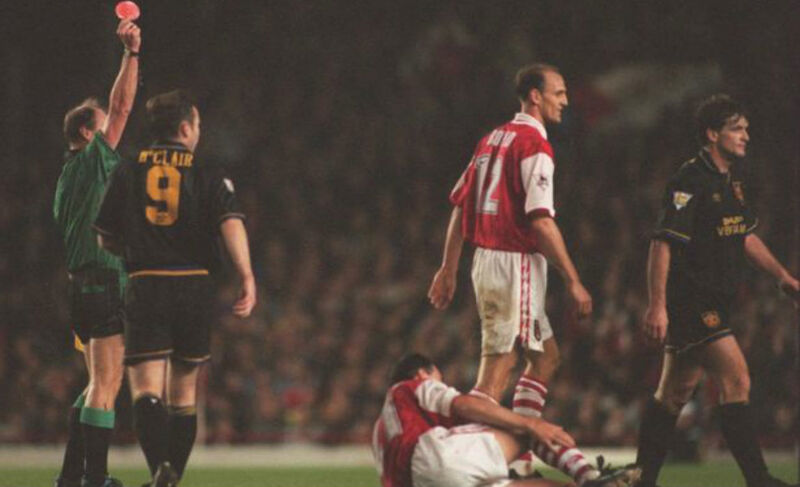 Arsenal were still under George Graham during this match, however the match was competitive till the last minute. 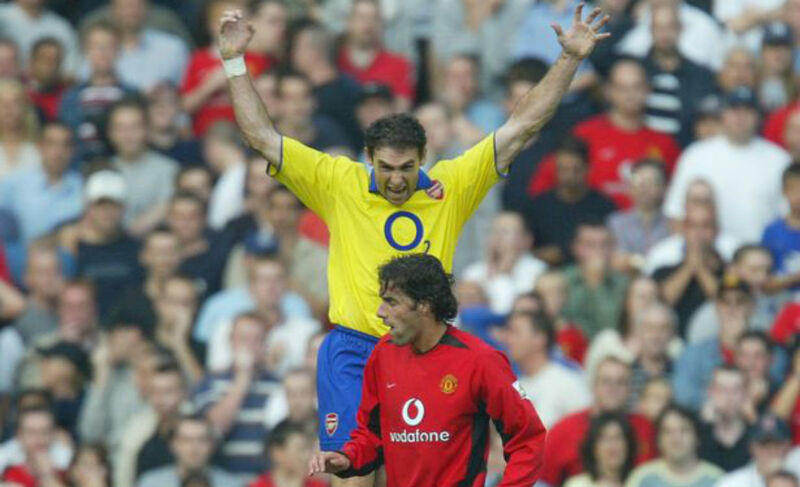 Six yellow cards were shown during the game, including Arsenal’s Paul Dickov, and United’s Keith Gillespie. While Mark Hughes was sent-off after receiving a second yellow just 11 minutes before the final whistle.